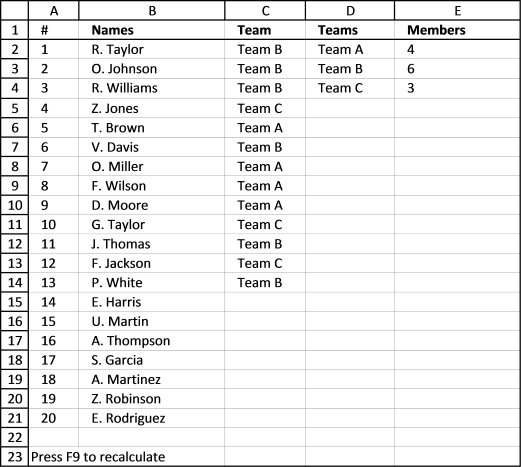 The image above demonstrates a worksheet containing Team names in an Excel defined table cell range F3:F7, you don't need to adjust cell references in the formula if you add or delete team names. It is dynamic and updates instantly. 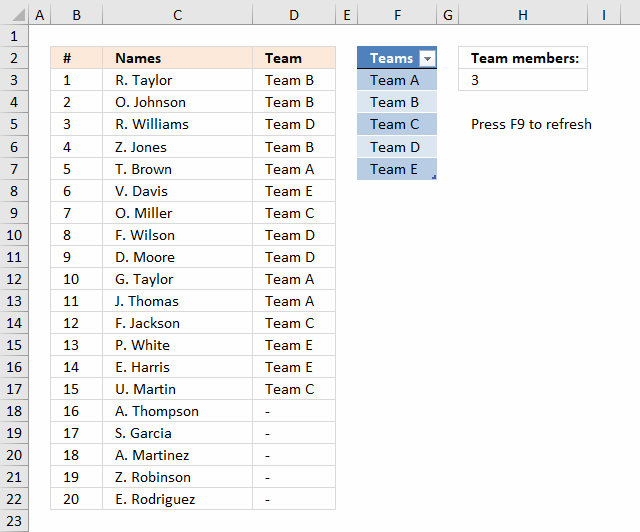 Enter the number of members in each team in cell H3, the formula refreshes automatically. 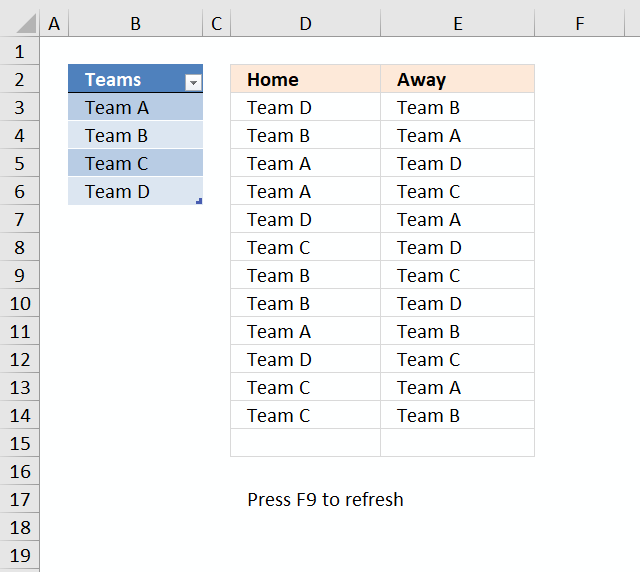 It randomly assigns teams to players, press F9 to refresh the formula output. Copy cell D3 and paste it down as far as necessary. The COUNTIF function counts values based on a condition or criteria, the first argument contains an expanding cell reference, it grows when the cell is copied to cells below. 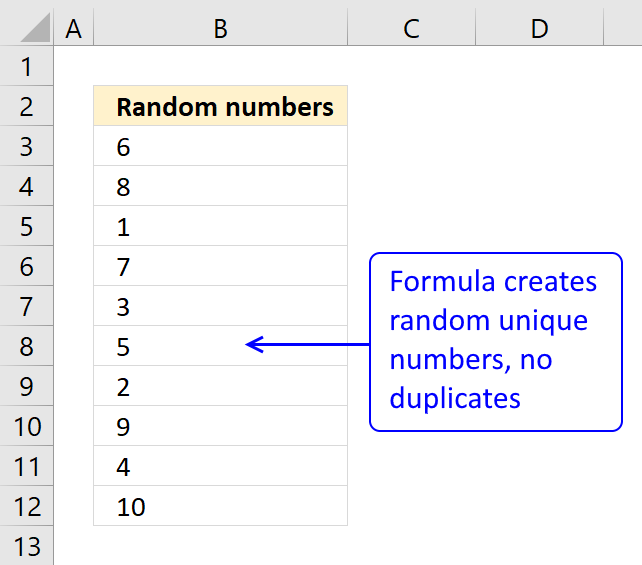 This makes the formula aware of values displayed in cells above. 0 (zero) indicates values that not yet have been displayed. This step is needed to create a sequence of numbers that will be used to get the correct value in a later step. The LARGE function returns the k-th largest number, LARGE( array , k). The second argument k is a random number from 1 to n.
and returns 2. This is a random number between 1 and 5.
and returns "Team B" in cell D3. The formula returns errors when all teams are populated, the IFERROR function converts the errors into a given value, in this case "-". Note: The IFERROR function catches all kinds of errors in your formula, this might cause you to not detect other errors in your formula. Use this function with caution. The is a fabulous tool! I used it for generating business simulation teams for a leadership development exercise at work. It worked great! Thank you so much! Thank you, I am happy you like it! Great post, worked really well. Used it in business competition teams assignments. Appreciate sharing the knowledge, thanks so much ! Hi, what if we have different number of people per team? So in team A, there could be a max of 4 members but in team B there could be a max of 6 members etc. Is there some formula which can be used for this as well? I have a question that may be more complex, but similar in theory. This is for a team building exercise in my classroom. I have 18 students. I want to generate groups of 3 that will allow each person to work with 2 unique people each time, with no repeats. I think this would mean 8 groups of 3, and 1 group of 2. Or, 7 groups of 3, and 1 group of 4. What if one of those names were to be absent, how would you write the code if say cell B4 was left blank an the generator didn't count them on a team? Great tool! I'm trying to understand how the formula works. Could someone explain what this part of the formula does? 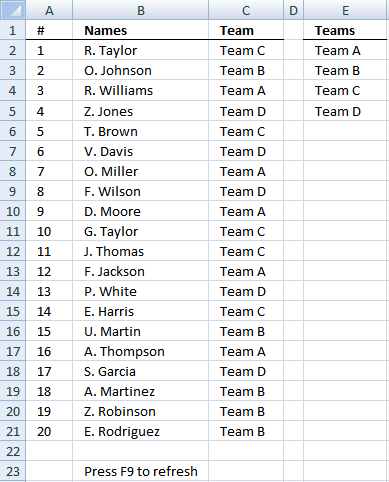 Do you have a template for 60 people to be randomly generated into teams of 4?